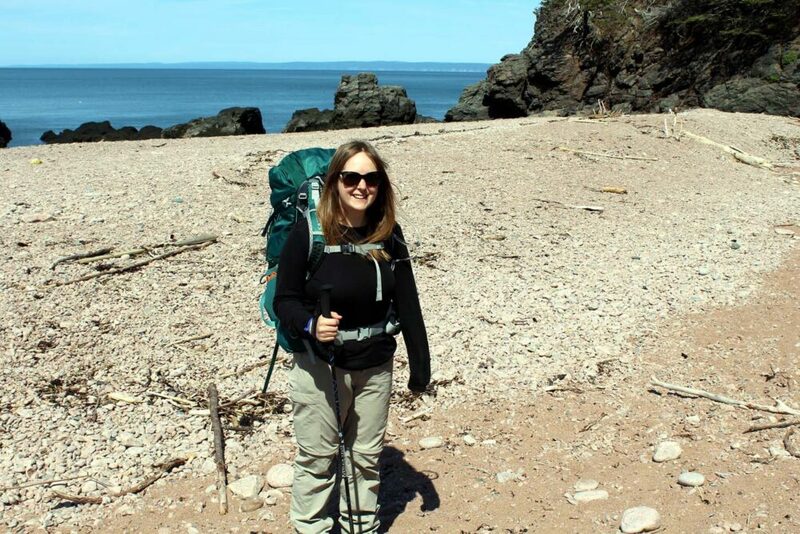 Cape Chignecto Provincial Park hosts one of the few multi-day backpacking trails in Nova Scotia. 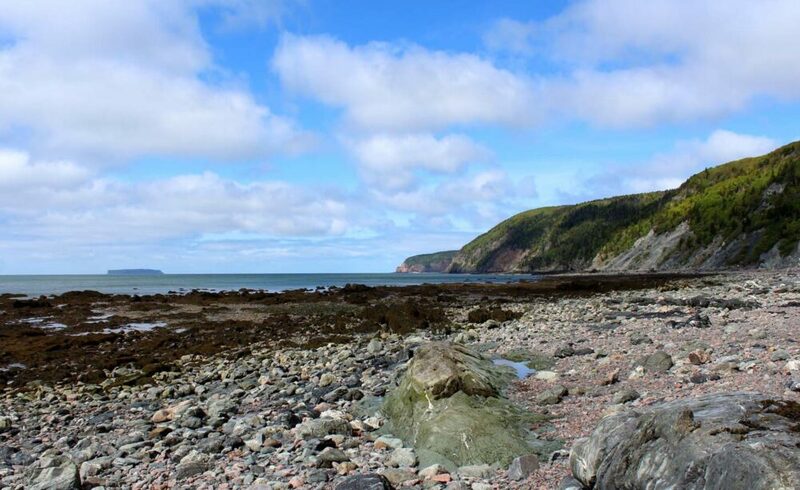 It is quality over quantity in this case, as the Cape Chignecto Coastal Trail provides a beautiful, varied and challenging hike, showcasing the power of the huge Bay of Fundy tides. This 51km circular trail leads hikers to the top of towering cliffs and dramatic rock formations, overlooking sandy beaches tinged with red. The ocean sparkles a beautiful (and perfectly clear) aquamarine blue in the sun. As is a necessity with most coastal hiking, you have to sometimes to leave the coast. 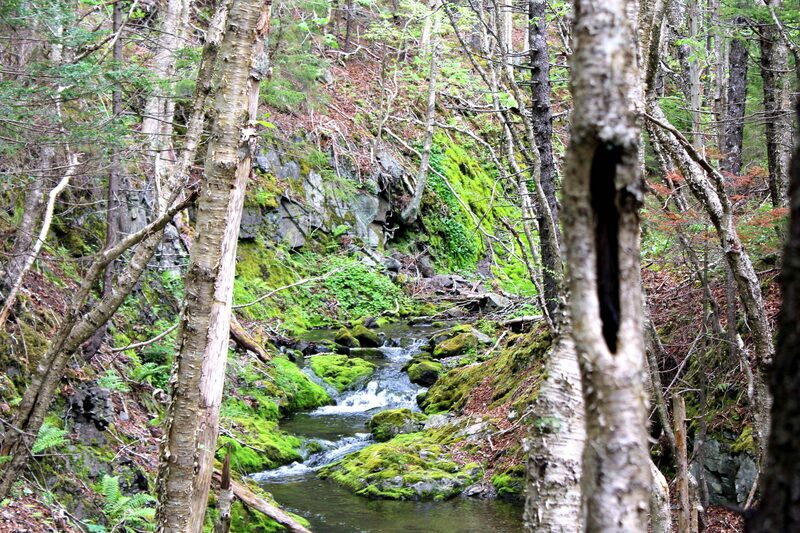 Rushing streams intersect the trail requiring detours, descent or an interval through the lush boreal forest. Some of these creeks continue on and cascade down the cliffs towards the ocean. It’s a wonderful sight, wherever you look. 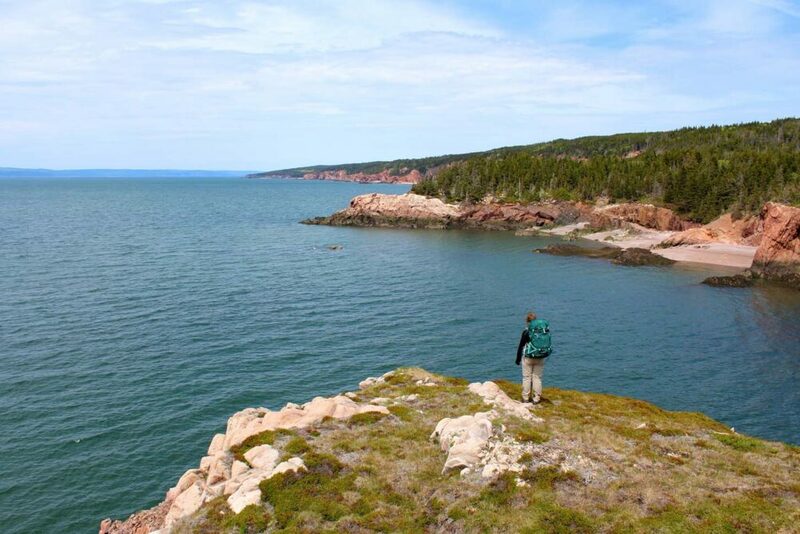 As mentioned, the Cape Chignecto trail is a 51km circular route, though most hikers don’t complete the full total. Almost everyone we met along the trail (and almost every account I read online prior) skips the section from the Red Rocks Visitor’s Centre to Eatonville. This 14km section almost entirely travels through dense forest. Since we had no second car and were not aware of an existing shuttle service, the only choice we had was whether we should hike it first or last. 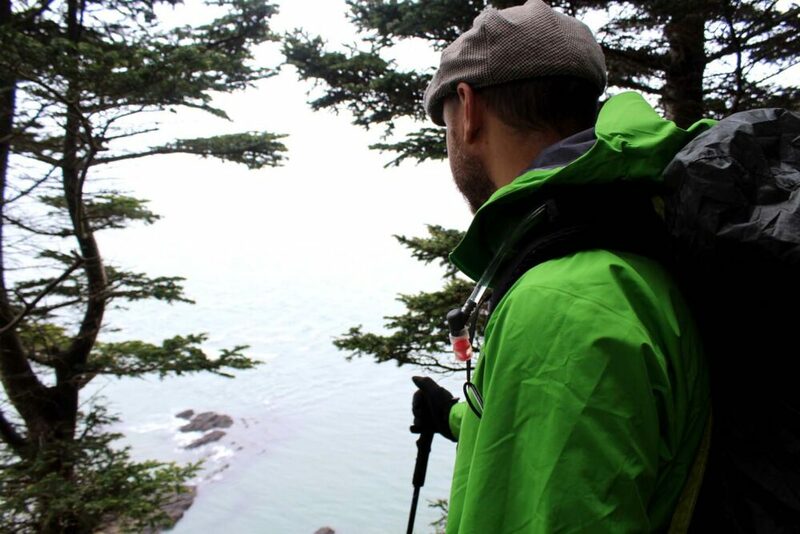 We chose at the beginning, in order to hike towards the coast rather than away from it. While this forest section is not remotely difficult by any means (and does have some pretty moments), I can understand why so many would make the choice to skip. 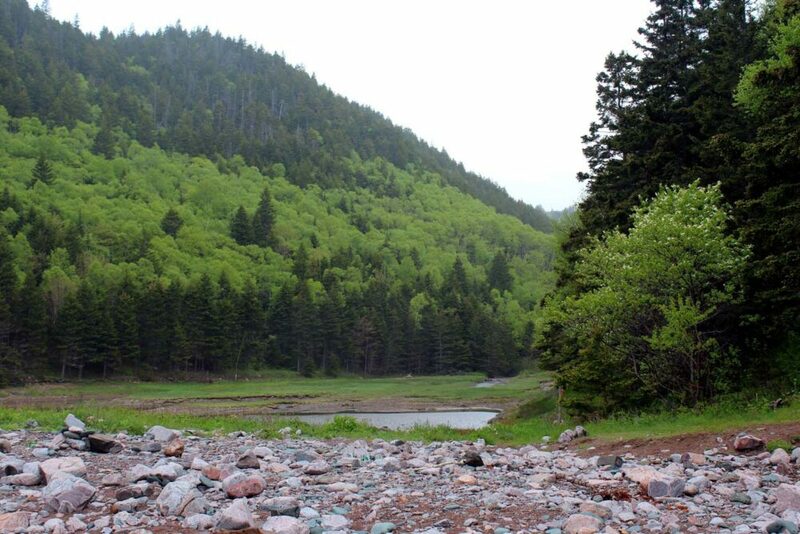 It is pretty unremarkable compared to the rest of the Cape Chignecto trail. It also made our first day’s distance total to be 22km, which is reasonably high. If I had to make the decision again now, I’d do the same. There is just something so satisfying about completing a full, circular trail. My favourite parts of day one? Starting the hike with a walk along the beach, lunch in Eatonville’s sunny meadow, finally spotting the ocean after almost 16km in the woods, admiring the impressive Three Sisters rock formation. Seal Cove may not have had any seals, but it was a welcome sight that first afternoon. The campsites are high above the beach itself, which offers a wide stretch of stones and sand bordered by soaring cliffs. 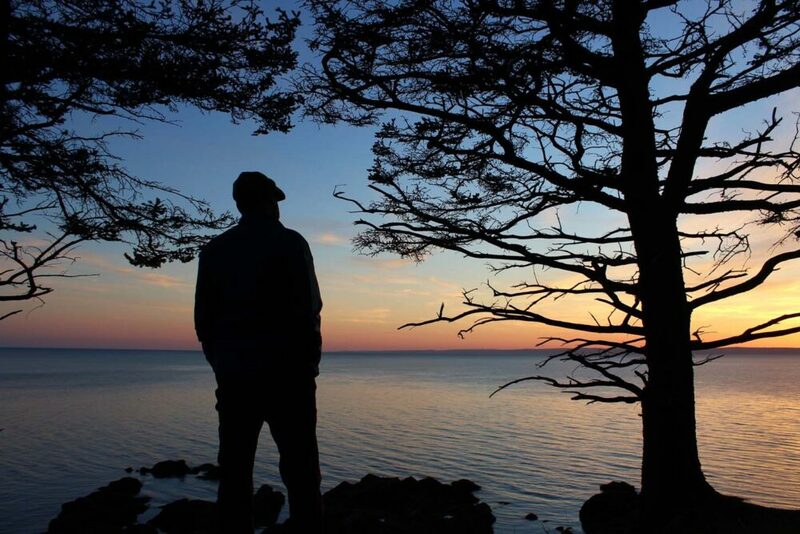 A lookout close to the trail offers the perfect spot to watch the sunset. This was by far our favourite campsite of all that we explored, though we did also have the best weather. Unfortunately, the cloudless blue sky did give way to a freezing June (!) night. As we later found out, the resulting frost devastated the growth of many crops all over Nova Scotia. 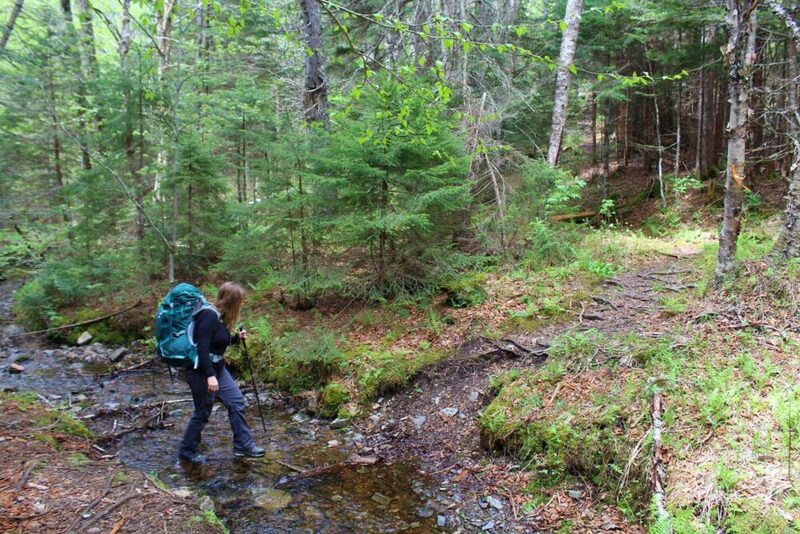 Whether it was the aftermath of hiking the 22km the day before or simply the trail elevation (hear a stream on the Cape Chignecto trail? Prepare to ascend), the Seal Cove to Big Bald Rock section was the most taxing for us. You may be surprised to hear it was also my favourite, for the trail stayed on the coast for almost the entirety and the views were fantastic, all day long. We visited every lookout and admired each ocean panorama. This day also had the best reward, since we had booked the Big Bald Rock cabin for the night. 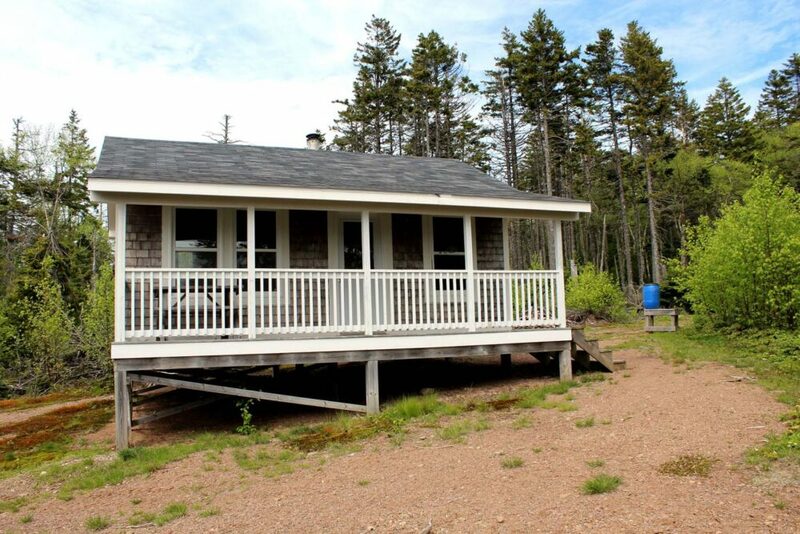 The Cape Chignecto trail has three cabins and one bunkhouse en route. While they may appear basic accommodation normally, these cabins are luxury after ascending and descending elevation with a backpack all day. Each cabin has four wide bunks (we shared one), a woodstove, a deck and seating. The cabins are locked, with the keys issued on registration to reservation holders. When the rain came in that evening, we felt very cosy indeed, in a warm cabin with ocean views, tortilla pizzas cooking ontop the wood stove and no tent to put up. 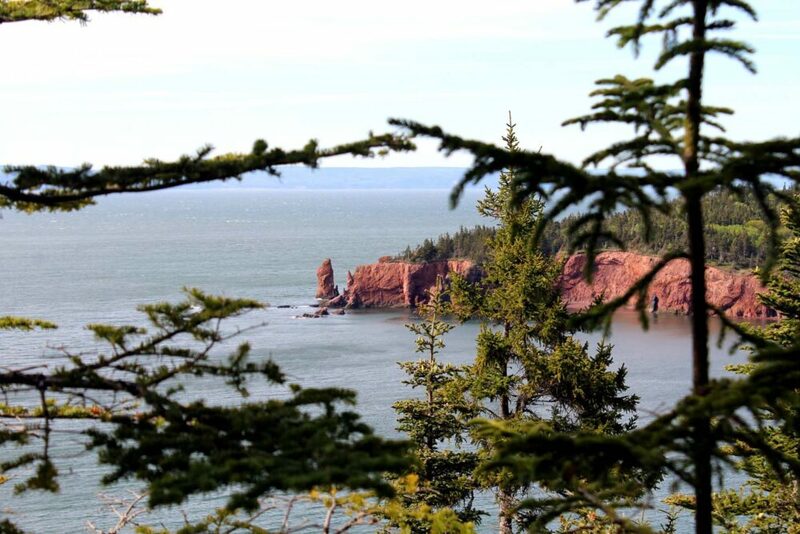 I can see why so many Cape Chignecto hikers stay exclusively in the cabins. Day three was one of mud. Now, we have a high tolerance for mud after hiking Cape Scott a few years ago (one of the wettest places around) so this wasn’t too much of a big deal. It did, however, reaffirm my choice in bringing my waterproof boots on this hike. 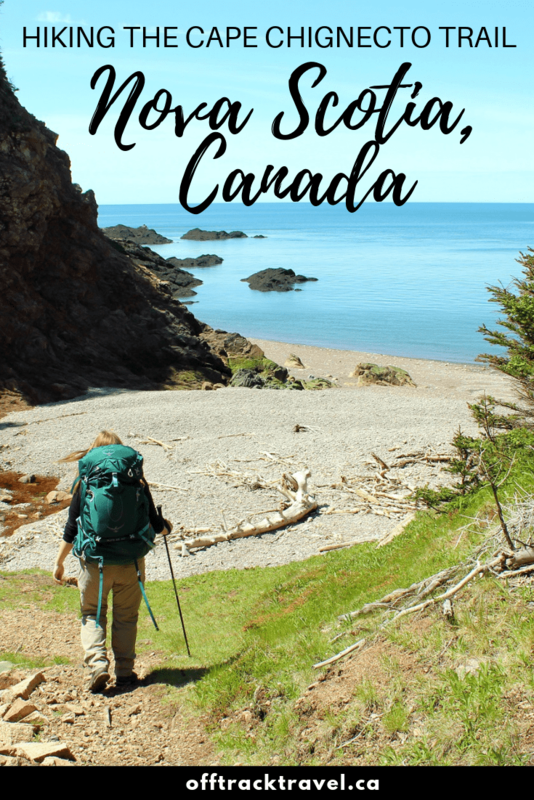 Also verified was our decision to hike the Cape Chignecto trail in a counterclockwise direction as soon as we descended the steep, rooty hill entering Refugee Cove. But I’m skipping ahead. 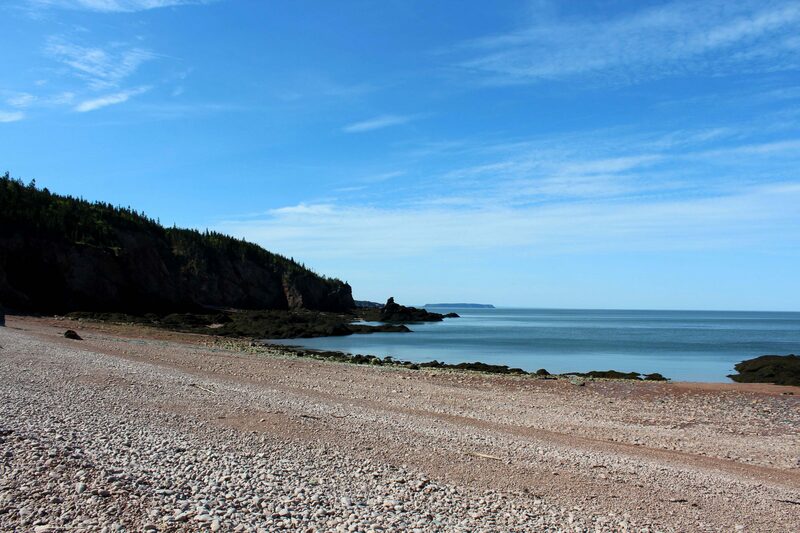 Before that, we visited the famed Cape Chignecto. The Cape itself isn’t much to write home about (a trail of rocks leading out to sea) but we enjoyed watching the waves collide and the seabirds ride the air currents. The Refugee Cove campsite is a dark little place in a valley; the real highlight here is the rocky beach a short walk away. For hikers travelling the trail in the clockwise direction, this would be the first real direct shore access (besides the beginning, if the tides are right). Arriving pretty early at 3.30pm, we probably could have continued on the last 8km and finished that day. But I’m glad we didn’t, for two reasons. The first is the two hills that follow Refugee Cove. They are real (killers? ), no matter which way you hike them. The 200m elevation is gained in a perfect 45-degree angle, straight up (or down). There are no switchbacks here. 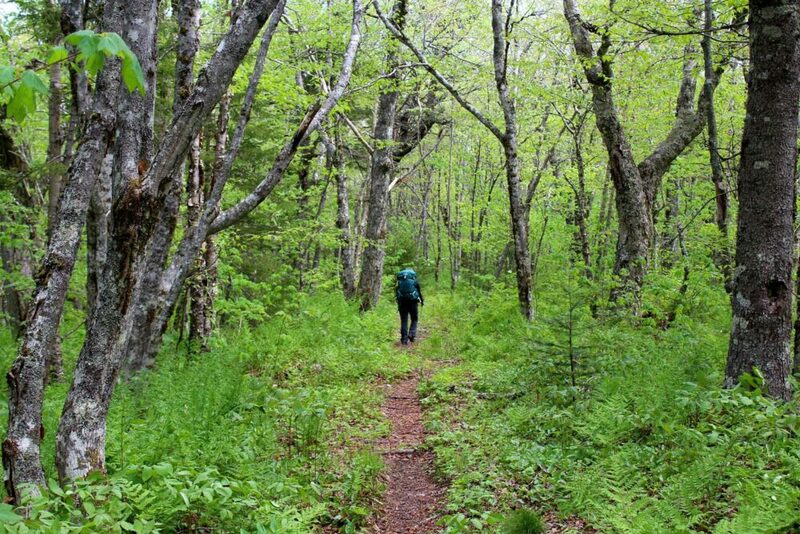 There’s no doubt about it, they’re a slog, and likely a memorable part of the trail for most hikers. I can tell you, however, that they were handled much better with fresh legs and a lighter backpack. The second reason was one of pure chance. The morning of our last day, we chose to eat breakfast on the beach. Even before sitting down and unpacking, we noticed something unusual. Just offshore, seemed to be a large school of fish, made obvious by water disturbance. Where there is fish, there is often other animals too. In this case, a group of porpoises. They didn’t hang about long, just long enough for us to see their dorsal fins rise and fall a few times and glide away. Definitely one of the more interesting mornings I’ve ever experienced on a trail! With whales on the brain, the rest of the trail was easy going. Those two aforementioned hills were the only real challenge, with flat intervals in the forest. There were less coastal views than I expected during this part, but it hardly mattered. Before we knew it, we were ascending the steps to the beach and walking final couple of kilometres of sand to the Visitor’s Centre. The tide was way, way out and we were able to jubilantly wander the beach and look back at the distance we had come. 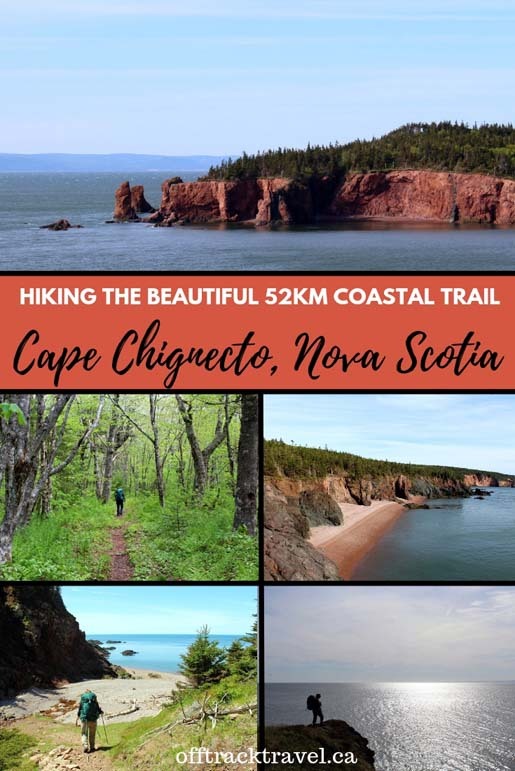 The Cape Chignecto Coastal Trail can be found in Cape Chignecto Provincial Park in western Nova Scotia, on the edge of the Bay of Fundy. 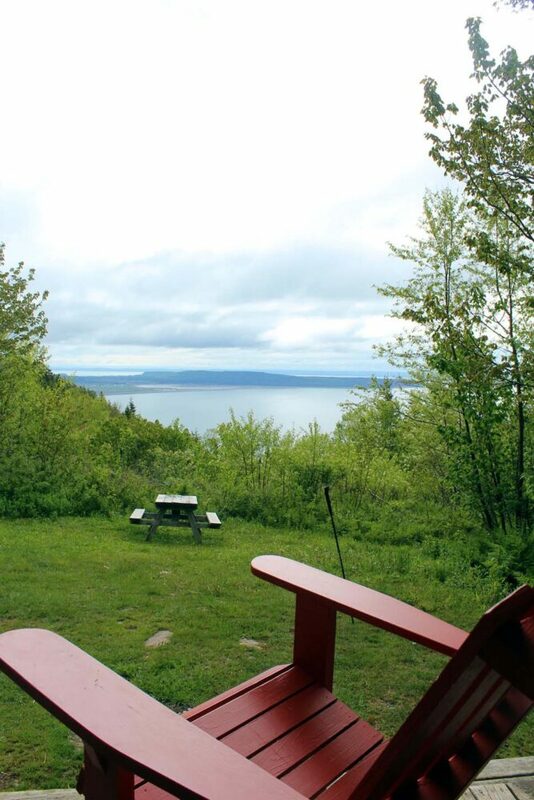 The trailhead is a 45-minute drive from Parrsboro and approximately an hour away from the New Brunswick border. 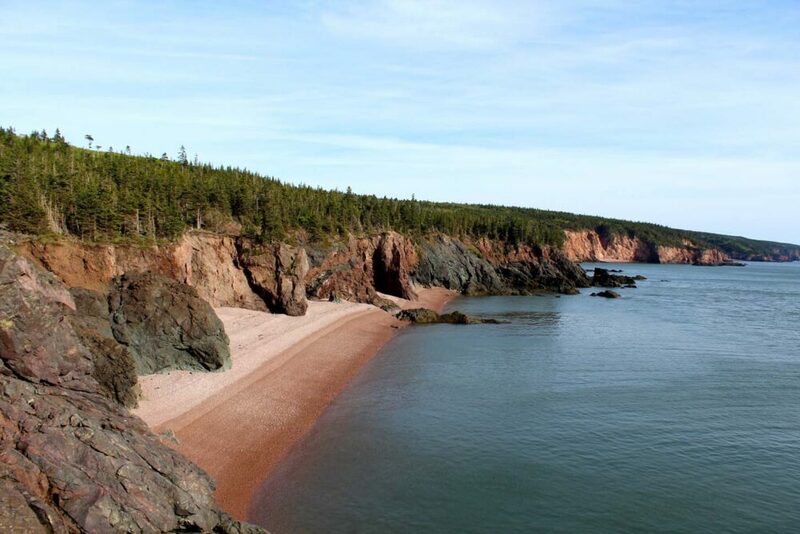 Cape Chignecto Provincial Park is open in mid-May and closes in early October. 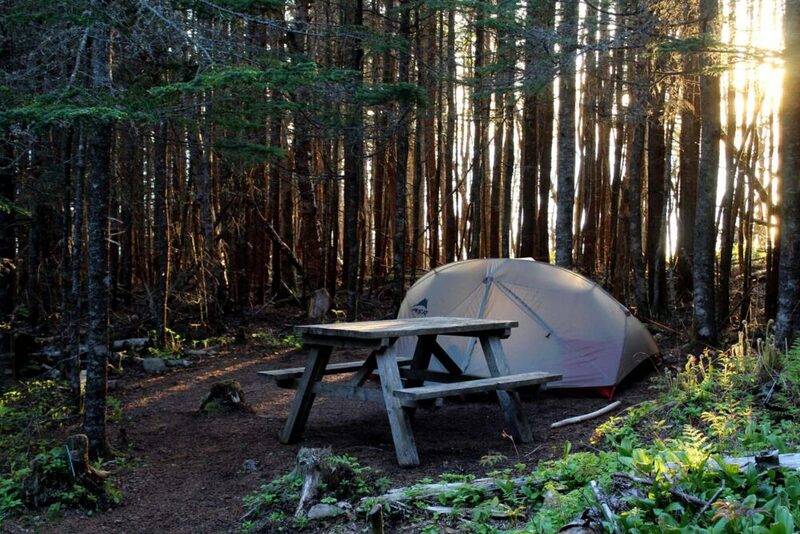 There are nine backcountry campgrounds in Cape Chignecto Provincial Park. Seven of these are located on the coastal trail route. In each of these campgrounds, there are 7-8 individual campsites, each usually featuring a picnic table. There is access to an outhouse, plus nearby water (usually a stream/river) suitable to treat with a filter. Campers should bring their own means to hang food/smelly items to avoid bear and rodent issues. 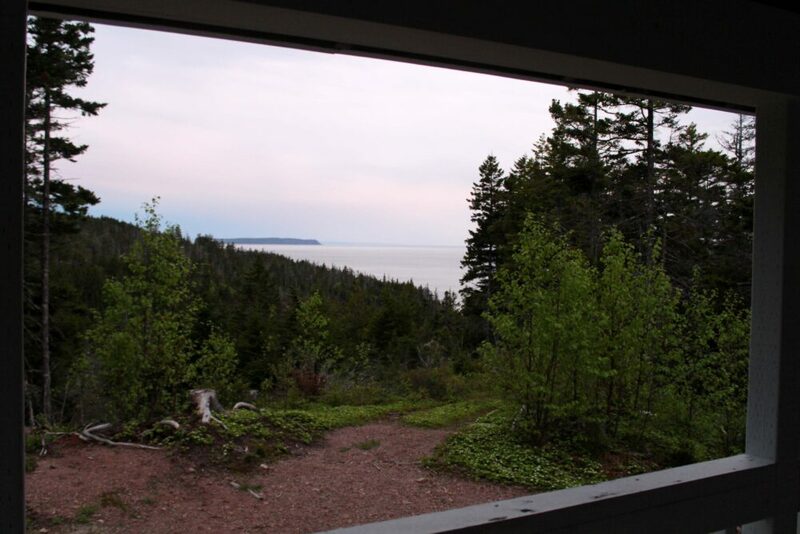 There are three cabins and one bunkhouse on the Cape Chignecto Coastal Trail. Each cabin and bunkhouse has access to an outhouse and water container (treating the water is recommended). 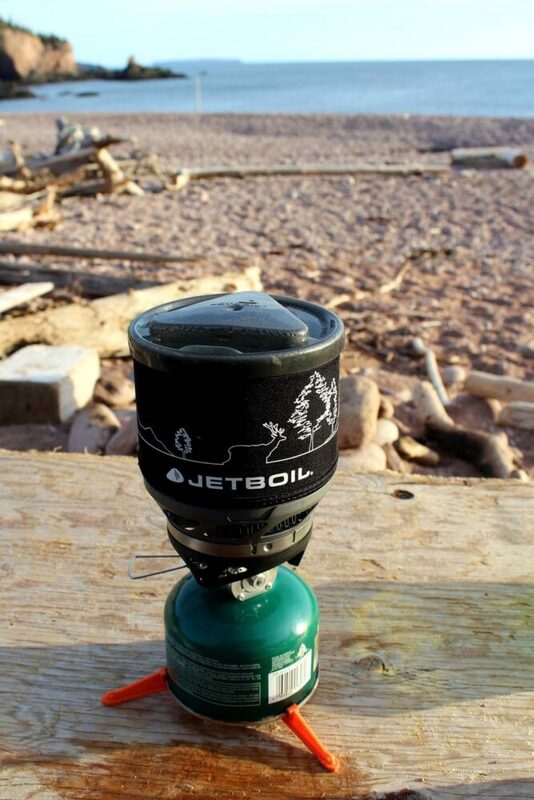 Campsites and cabins are allocated either by reservation or on registration at the Red Rocks Visitor Centre. We reserved our sites two weeks in advance to secure use of the Big Bald Rock Cabin. 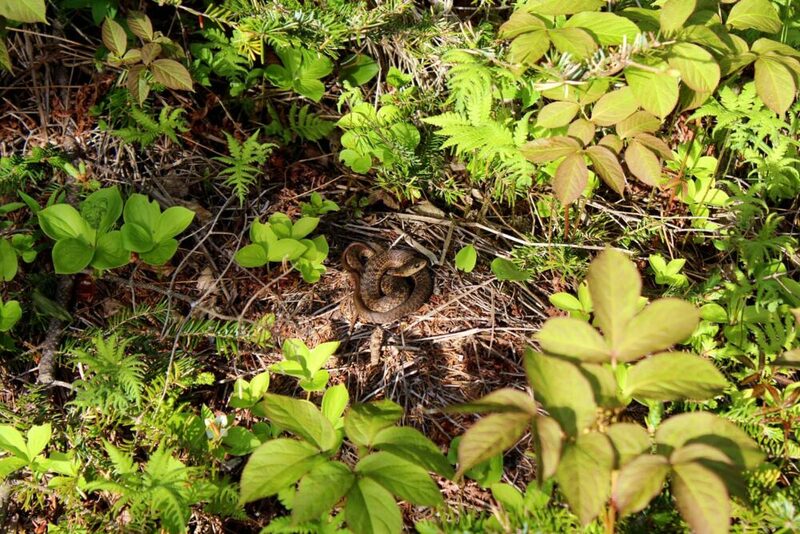 Otherwise, we would not have bothered for our early June hike as it was reasonably quiet. 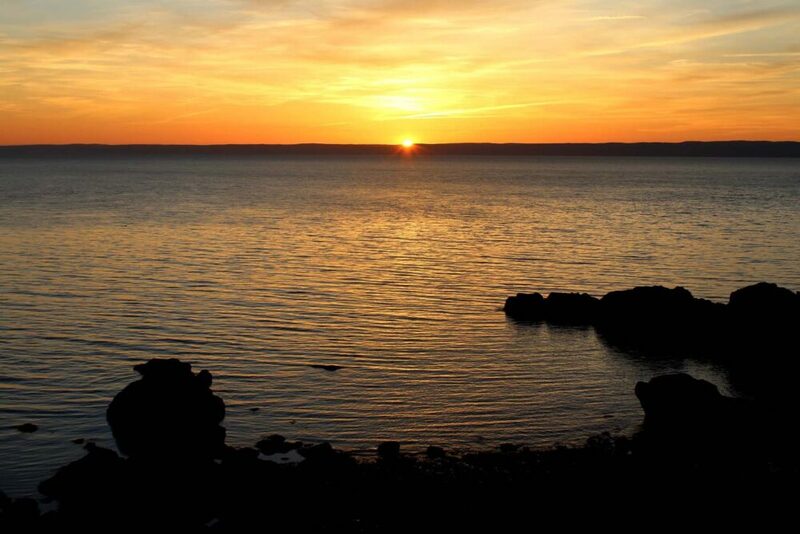 Reservations can be made on the Nova Scotia Provincial Parks website for both campgrounds and cabins (select ‘backcountry hiking’ as camping type). 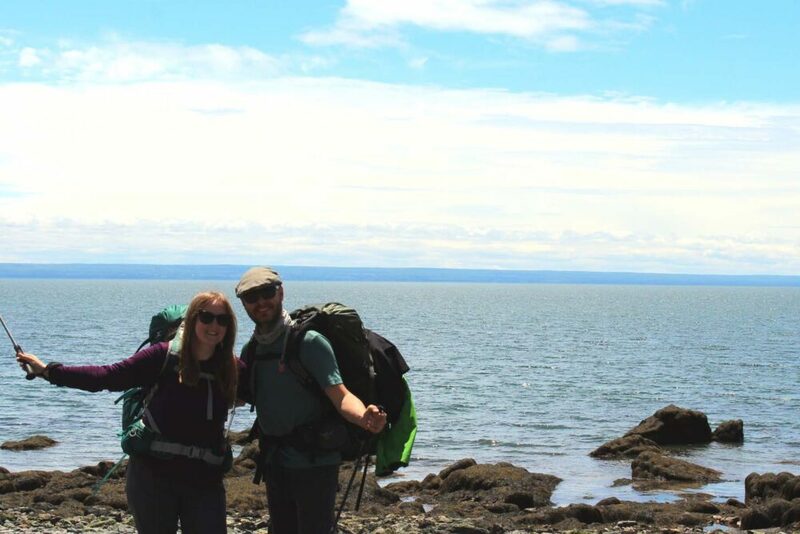 Planning to stay in Parrsboro before or after hiking the Cape Chignecto trail? 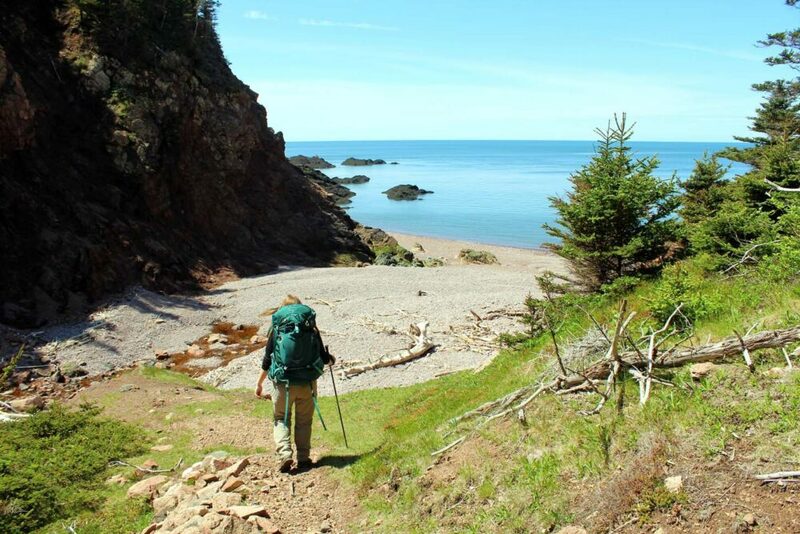 There is no charge to hike on any of the trails in Cape Chignecto Provincial Park, however, the campsites, cabins and bunkhouse all have a flat nightly fee. 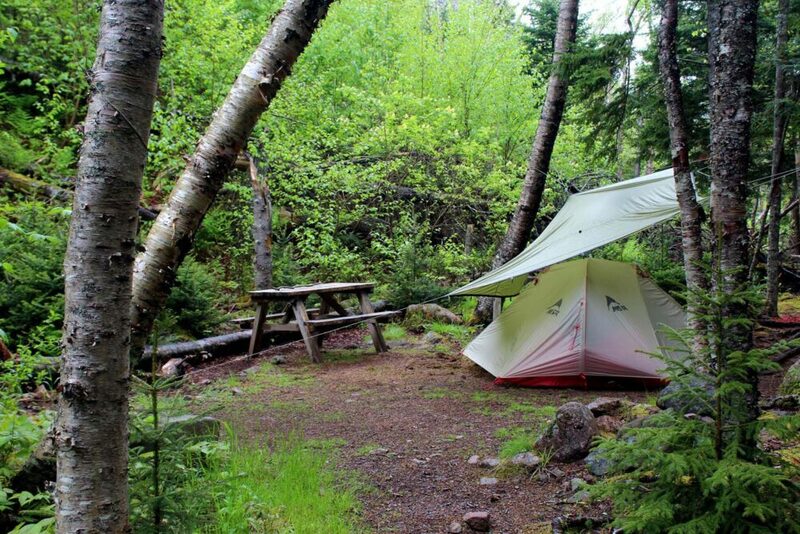 Up to six people can share each backcountry campsite. Up to eight people can share the cabins and bunkhouse. The Arch Gulch and Big Bald Rock cabins can also accommodate four people camping in tents outside. Cabins and bunkhouses are exclusively reserved/allocated to one group e.g. we hiked as a group of two but we had exclusive use of the Big Bald Cabin. 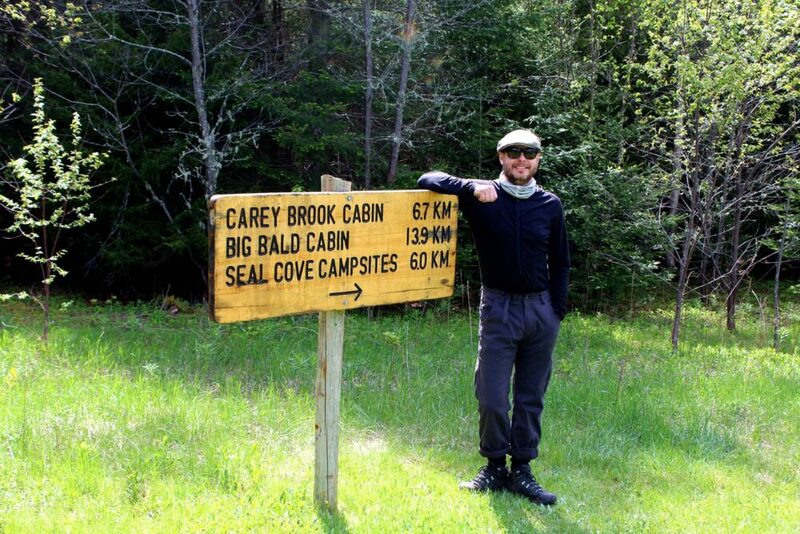 Which way to hike the Cape Chignecto trail? 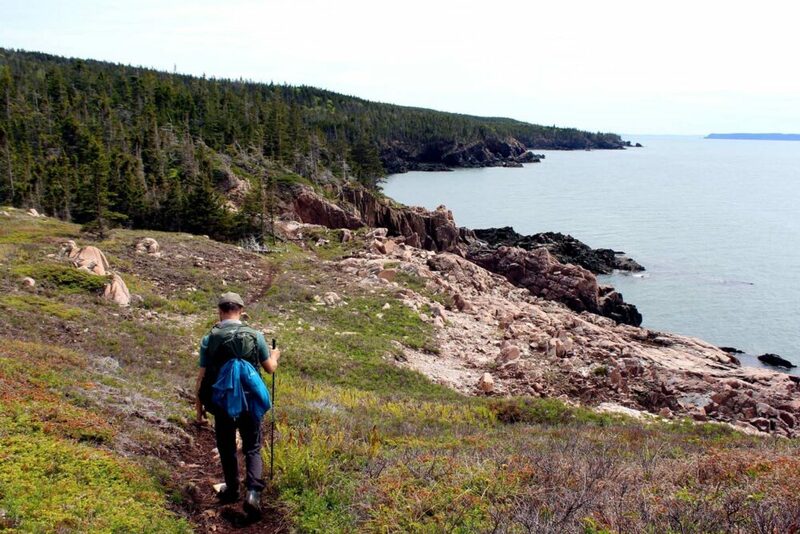 As mentioned, it is possible to hike the Cape Chignecto Coastal Trail clockwise or counterclockwise direction. We travelled in a counterclockwise direction and were happy with our choice. I think I would have found hiking the Eatonville forest section on the last day a bit anti-climatic. Before starting on the trail, hikers must check in at the Red Rocks Visitor’s Centre. Luckily, the Centre is open long hours – 8.30am to 8 pm during our June visit. Some hikers then choose to park or leave from the Eatonville trailhead. If you wish to skip the Eatonville forest section but do not have two vehicles, there is a shuttle service run by the Advocate Country Store in nearby Advocate Harbour (reservation recommended, on request only). 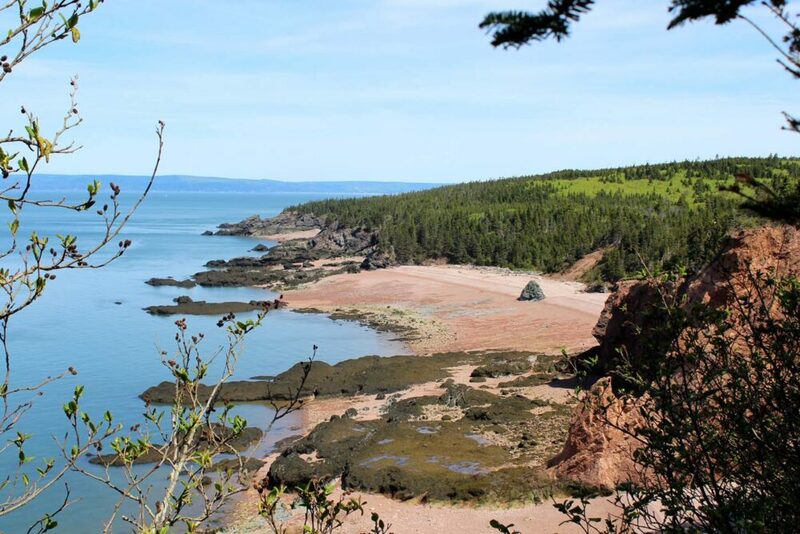 In general, we found the Cape Chignecto coastal trail to be in good condition. The majority is of backcountry standard with steep, rocky, muddy and rooty sections. Travelling over small streams and creeks is necessary. 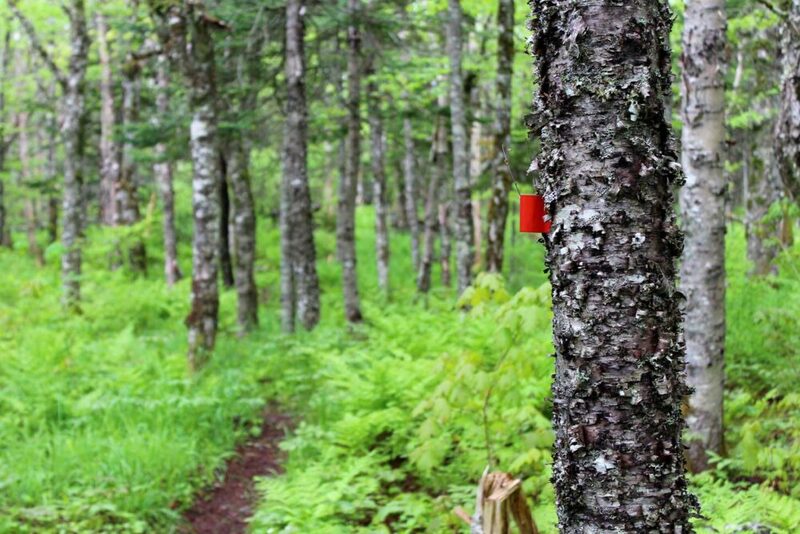 The trail is well defined and signposted throughout, with red markers on trees and rocks at least every 100m or so. Reasonable phone signal is available throughout most of the trail. On this trip, we both tried out new backpacks. I used the Osprey Aura 65, Jean Robert the Osprey Aether 70. These packs are a lot larger than what we’ve used previously for hikes of this length. While this amount of space was certainly not needed, the support was much appreciated. My Osprey Tempest 40 is wonderfully light and just about the right size for a three-night hike, but the hip support is sorely lacking. Consequently, I will now probably only use it for day hiking and hut-to-hut (or British style) backpacking. Clothing-wise, we wear a lot of Icebreaker merino wool base layers and socks, plus Prana hiking pants, Arc’teryx jackets and hiking boots by Salomon and Oboz. Like this post? Save or PIN it for future reference with one of the below images for future reference and then join our mailing list!